For far too long you’ve felt insecure about your smile. You’ve hidden from camera lenses and lamented over the idea of talking in front of large crowds of people. These fears have centered around your teeth. You’ve never been comfortable with the way they look, and as a result, have felt inadequate. 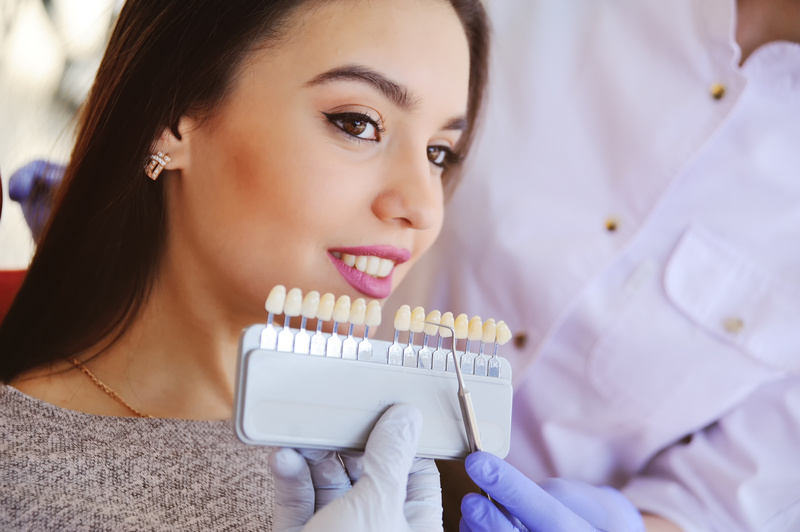 But the time has come for you to make a change and start living your life to the fullest, by fixing your smile and confidence, but you’re unsure about which route of cosmetic dentistry to take. Your dentist recommends porcelain veneers of Los Angeles and provides information on their many benefits. Porcelain veneers are thin strips of material made from dental-grade porcelain that over your front teeth. They are designed to improve your smile by fixing gaps, chipped and cracked teeth, slight misalignments and discoloration. The process to get your veneers is usually completed in a maximum of two visits to your dentist, starting with an initial one to discuss your desired smile and to have your teeth evaluated to make sure that you’re a good fit for veneers. Next, your teeth will be prepared and shaped so that the new veneers will fit perfectly. This involves filing down a small amount of enamel. You will then have an impression taken of your teeth to make temporary veneers. After your permanent set are crafted, you will return for a second visit to have them bonded to your teeth. There are a host of benefits of porcelain veneers. Longevity – Your veneers are made from a strong, durable material and can typically last up to 15 years with proper care. Natural Look – Veneers are custom designed to closely match the color and shape of your teeth to give a natural look. Fast Process – Typically, the process for placing veneers can be completed in two visits. Stain-Resistant – Another advantage is that your veneers are more resistant to stains than your natural teeth. Decreased Tooth Sensitivity – Any sensitivity that you may have to hot or cold foods and drinks will usually be lessened with porcelain veneers. Ultimately, all roads lead back to increased confidence. This is super important because the way you feel about yourself affects how people respond to you and also, your own total wellness. Contact your cosmetic dentist in West Los Angeles to inquire about this amazing process and learn more about how porcelain veneers can change your life for the better. Dr. Les Latner earned his Master’s Degree in Kinesiology from UCLA and then went on to receive his dental degree from Washington University School of Dental Medicine in St. Louis. He serves on the Board of Directors of the American Academy of Cosmetic Dentistry and is a clinical assistant professor at the UCLA School of Dentistry. He practices at Westside Dental Associates and can be reached for more information through his website. by: Les Latner at January 12, 2018 .